Cobalt Octoate with 6% Cobalt content is an effective accelerator for polyester. It affects curing or polymerization of Unsaturated Polyester Resins in combination with catalyst likes MEKP (Methyl Ethyl Ketone Peroxide). uniform drying. Cobalt is generally used in combination with other metals, such as Manganese, Zirconium, Calcium & Combinations of these metals. As the quantity of Cobalt Drier used is very small, it minimizes discoloration in paints & enamels as compared to other Driers. Cobalt does not discolor white pigment pastes and/or paints as the deep blue color of the Cobalt counteracts the yellow of the oils & resins, thereby enhancing the whiteness of the molded articles or a painted surface. The unique feature of cobalt is that it is least affected by atmospheric humidity. But solvent may evaporate if left open. Available in 250ml., 500ml., 1liter, 5liter, 30liter, 200liter plastic containers. 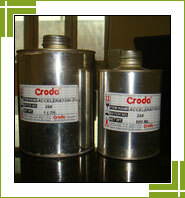 It is Cobalt Octoate dissolved in hydrocarbon solvent. It is violet colored volatile liquid. It is activated with Hardener also called MEKP catalyst. Available in 250ml., 500ml., 1liter, 5liter, 30liter plastic containers. It is clear, colorless, slightly viscous liquid with sharp, pungent smell. 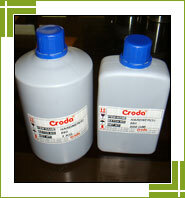 Freely soluble in most organic solvents. It is Methyl Ethyl Ketone in Phthalate plasticizer. Dilute solution of MEPK initiates Polymerization of Polyester Resins in glass-reinforced plastic, and casting. MEKP in the system dose this through production of free radicals. For Gel coat formulations and FRP molding the quantity of Accelerator 2% and Resin hardener required for room temperature (25oC - 45oC) curing may be so adjusted that the resin gels to a tacky condition within the required time (Approx. 20-30minutes). More delayed gel times may cause styrene loss which in turn may result in under cure. For Hand lay up technique of FRP molding at ambient temperature of 250C, 2-3% hardener with 2-3% accelerator will give satisfactory results with most of the resins. In gel coats the quantity of hardener and accelerator should not be reduced below 2% to ensure proper curing as gel coats are relatively thin. For laminating applications smaller quantities of hardener and accelerator may serve the purpose. Take extreme care and do store accelerator & hardener at separate isolated places. Never mix two directly since mixture is flammable. 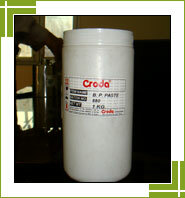 It's a white thixotropic paste used as an initiator for curing of unsaturated polyester resins. 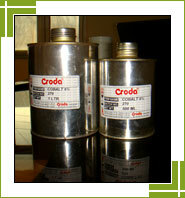 Main application is curing of putties at ambient temperature in combination with amine accelerators. Benzoyl Peroxide 121 if a free flowing powder finds its application in construction industry especially for curing resin systems used for grouting and in food industry especially for flour bleaching, cheese bleaching etc.